KEY WEST, Fla.-Being the sole community provider is a challenge anywhere, but in a place like the Florida Keys, the burden is magnified, especially when the Atlantic Ocean is restive. After all, "it's not a matter of if a hurricane is going to hit, it's when a hurricane is going to hit," said David Clay, CEO of Lower Keys Medical Center, the sole provider for Key West. And when a hurricane hits, as Irma did in early September, a hospital's service to its community is truly tested. Adhering to a mandatory evacuation, Lower Keys Medical Center shut it doors, including to the emergency department. If the hospital's ED isn't open though, first responders can't work because there's nowhere to seek care if someone is hurt on the job. The city's EMS cannot begin search and rescue. Water and electric companies will not send workers to restore water and power to the city. Effective planning made it possible for Lower Keys Medical Center to reopen days after Hurricane Irma hit the area. "If we don't open, none of them work. So that means the entire recovery efforts for the Keys are at a standstill," said John Emery, Lower Keys Medical Center's chief operating officer. More than a month after Hurricane Irma tore through the Florida Keys, Lower Keys Medical Center is still grappling with its aftermath. About 5% of the facility's employees still haven't returned after the storm devastated the Keys and flattened their homes. Another 28 employees lost everything. The majority of those employees are shuffling from one hotel to the next, while Lower Keys Medical does what it can to find them shelter. Franklin, Tenn.-based Community Health Systems, owner of Lower Keys Medical, said hospital response efforts in the face of hurricanes Irma and Harvey reduced operating revenue in the third quarter by $40 million. Knowing that the Florida Keys is ground zero during hurricane season, the hospital and other local partners every June hold a full-scale mock evacuation drill with the North Carolina National Guard standing in as live patients. Hurricane Irma formed in late August and made its way toward Florida. By the time it slammed into the Keys on Sept. 10 as a Category 4 monster packing 130 mph winds, Lower Keys Medical and other CHS-owned Florida hospitals had been prepping for about a week, holding two-a-day conference calls. Lower Keys loaded up on 15,000 gallons of diesel fuel for generators. It stockpiled food, water, pharmaceuticals and linens. It shuttered windows and made sure that it had several satellite phones. Staff even readied Emery's boat to transport team members post-hurricane if a bridge were to crumble during the storm. Florida Gov. Rick Scott ordered a mandatory evacuation of Monroe County on Sept. 6. 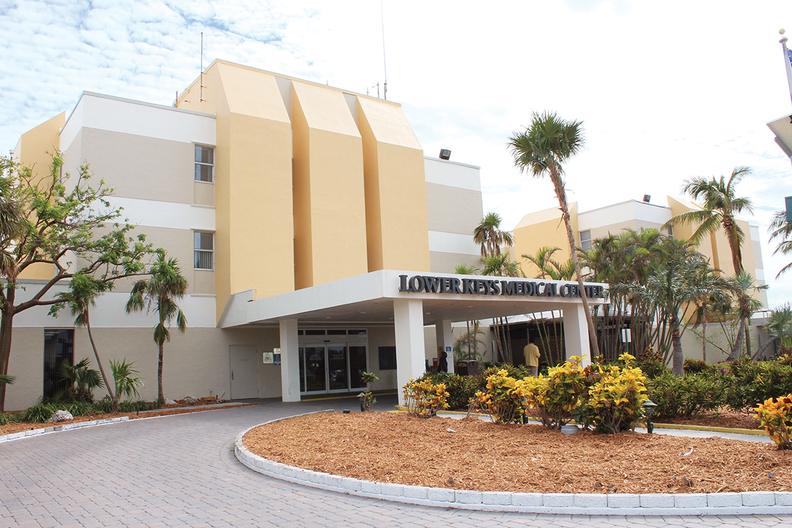 On the same day, Lower Keys Medical Center evacuated 13 of its medical and behavioral health patients to Gadsden (Ala.) Regional Medical Center. Starting that night, any Lower Keys' staff members that chose to keep working in the ED did so as volunteers. 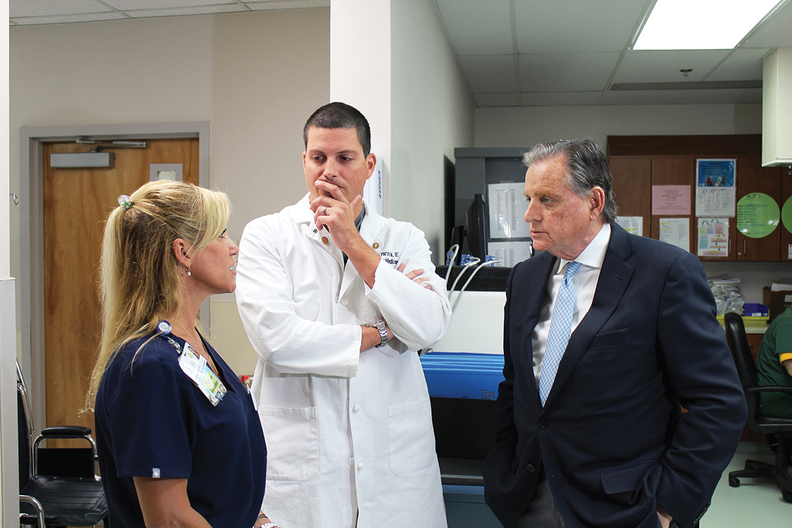 CHS CEO Wayne Smith speaks with clinicians at Lower Keys Medical Center on Oct. 18, a month after the hospital reopened. About 20 employees, including nurses, an ED physician, a respiratory therapist and the assistant CEO, chose to stay. Some sheltered inside the hospital, while other staff stayed at a local hotel rated to withstand the most powerful storm, a Category 5. A few more holed up in an ED physician's home. CEO Clay and COO Emery evacuated together and ran incident command from Bradenton, Fla., just south of Tampa. Emergency medical services officials for the area were informed about each employee's location. "A lot of the staff that stayed chose to stay because they care deeply about our community and they want to make sure that when those first responders are ready to get back on the road and start working, that they're here to provide for them," said Assistant CEO Matthew Conrad, who didn't evacuate. The hospital closed its ED for the first time in a decade on the morning of Sept. 8. Just a few hours after Hurricane Irma blew through Key West on the morning of Sept. 10, the ED opened again at 3 p.m. for first responders and the critically injured. The hospital fully re-opened a week after the storm on Sept. 18. Reopening the ED and the rest of the hospital so quickly took coordination and communication between the corporate office, Lower Keys' Medical Center leadership in Bradenton, medical staff on the ground in Key West, and city and county officials. After the storm, the city sent a firetruck to track down the nurses and other staff who had sheltered in Key West and headed to the hospital to begin cleaning up. The hurricane had downed palm trees and stripped the mangroves bare of their leaves. A few of the hospital's windows shattered, but the ED was largely in good condition. Medical center staff set up a makeshift command center in the front lobby to keep track of employees as they arrived back at the hospital during the week and dole out assignments. All employees pitched in to clean the inpatient side of the hospital, scrubbing walls and taking out the trash. Coordination with CHS executives in Tennessee helped secure resources needed to re-open, including the fuses and engineers needed to get the chillers up and running, as well as the reagents needed for the laboratory. Absent a working lab or radiology unit, doctors and nurses relied on their training to make clinical decisions without diagnostic tests. Though Key West didn't have flowing water after the storm, an aqueduct provided non-potable water. Before the city's water plant was operating, the fire department transported water via fire engines to keep its chillers running. That's a testament to the importance of building relationships, Clay said. "Those relationships, you don't build those during a storm," he said. "Those relationships have to be developed along the way."